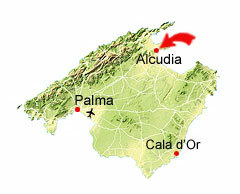 Port d’Alcudia is located on the north coast of Mallorca, approx. 60 km from Palma de Mallorca. The drive from the airport is mostly on the motorway and usually takes less than an hour by car. The Alcudia bay has a fantastic sand beach! The beach is 10 km long and goes all the way from Ca’n Picafort in the south to Port d’Alcudia in the north. 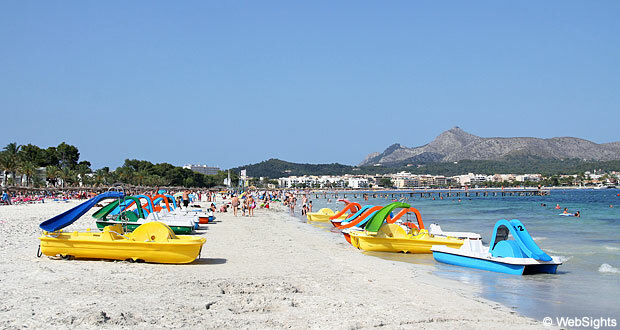 The beach is widest at Port d’Alcudia, up to 100 metres wide. The sand is golden and fine-grained, and the very shallow water is usually completely calm. It is lovely to splash around in – also for very small kids. There are many sections where it is possible to rent sun lounges and sunshades, but there is also plenty of room for those, who prefer to lie on their towels. The facilities also include showers and toilets. Behind the beach, there is a sea front with hotels, restaurants, shops, etc. Here you can buy everything from food and drinks to beach balls and rubber boats. By the harbour in Port d’Alcudia, there is a large playground. If you come by car, it is possible to park in the streets behind the beach. It doesn’t get better than this. The beach in Alcudia has lovely, fine-grained sand an very shallow water. There are rarely any waves. In several places along the beach, you will find all kinds of water sports such as parasailing, water skis, jet skis, water bikes etc. There are many restaurants, cafés and bars at the beach in Alcudia. At the beach itself, there are several beach cafés, and there are many more along the sea front and in the streets behind the beach. Port d’Alcudia is the largest and most popular holiday resort in Mallorca, especially among families with young children. Here they will find all kinds of shops, activities, playgrounds and, not least, the most child-friendly beach in Mallorca. Most of the hotels have 3 stars and are aimed at families with children. One of the most child-friendly hotels is the 4-star Zafiro Tropic . Here there is an entire pool area with a large pirate ship for the children, and it is not far from the beach. There is a large number of restaurants in Port d’Alcudia and many of them serve international dishes, but there are also Italian, Chinese, Indian and more traditional Spanish restaurants. Several of the best restaurants are located near the harbour. In the outskirts of the town, you will find the large Hidropark Alcudia water park. A little further into the country, you will find Alcudia old town, which is one of the greatest tourist attractions in Mallorca.